Another frustration is Talon. I mean, the Order of St George is a generic hunter organisation, fine, whatever – and the corruption storyline is actually somewhat interesting. But Talon? Talon is a world-wide organisation of dragons after power and control hunting down the naughty evil rebels and any outsiders. Fine – but the reason why Talon was created was, we were told, because dragons were literally facing extinction. They had to come together, as a unified force, to protect themselves from St. George’s genocidal campaign. Even now, part of Dante‘s spooky mission for Talon which is getting him all conflicted is out of need for soldiers to fight. 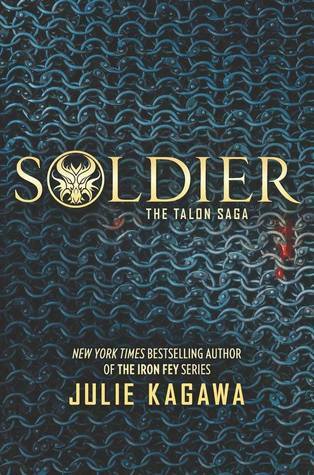 In fact, look at that – a generation, maybe several generations, of dragons have grown up knowing Talon and only Talon. We even have suggestions that Talon has erased entire concepts from draconic culture in order to make everyone better Talon agents – there are implications to damaging this organisation which is quite literally the only culture most of these dragons have. These are debates, complexities, problems which are just ignored. Gah, you could replace “dragon” with “weremole” and not appreciably change the story. You could transport these characters into any pretty generic YA and not change the story. The story itself is just so lacking in anything distinctive – the big evil organisation is doing big evil things while the protagonists focus on their love triangle: anything more interesting or potentially useful (like the draconic fight against extinction or the Eastern Dragons) are just side notes that don’t add enough to the story to change the basic generic set up. I’m just frustrated that all this potential to be something different just doesn’t seem to be explored at all. We have the introduction of the Eastern Dragons which could definitely be interesting, add new concepts of dragonhood and explore draconic culture. It also adds so much needed racial and gender diversity to this all white and heavily-skewed male series (there continue to be no LGBTQ characters). Except she appears, declares Talon evil, apparent lives in a Temple with lots of monks being vaguely spiritual in some way, Ooooooommmmm… and that’s about it. Any more detail or involvement or… nope? Ooookay then. This ill-defined monk-connection apparently gives her useful people in the west as well…?